One of the more intriguing finds at the end of WW II was this enormous four-wheeled vehicle made by Krupp. Listed as a Räumer S, it is still debated as to what exactly was this thing supposed to do. Was it a heavy prime mover, a mine clearing vehicle or somebody's nightmare turned into metal? The tall ground clearance and heavily armored cabin leads me to believe it was a mine clearer. The double-ended feature allowed it to drive back through a minefield without having to turn around. 180º in zero feet! What I thought was weird was the highly exposed hinge mechanism under the middle of the vehicle. Surely any exploding mine would damage the hydraulics and jam the hinge pins with dirt and shrapnel. I’d like to see one of those girlie Monster Trucks try and take on this beast! Oh well, on to the kit. I originally saw a build up of this kit in Military Miniature in Review #25 and I had to have it. I visited New Connection's website (now in English) and after taking a sizable chunk out of my credit card, the kit was winging its way to me. The box covered in German Postal Stamps was smaller than I expected. I feverishly opened the box to find it filled to the brim with carefully wrapped resin parts. 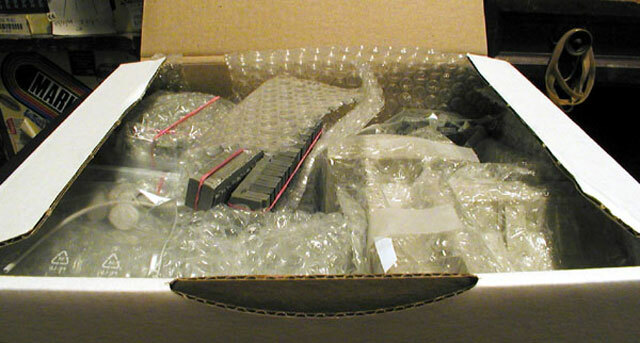 Three-ziploc type bags carried the smaller items with the larger castings lovingly wrapped in bubble wrap and secured with red rubber bands. All the larger castings had the pour blocks already removed. The cabins were large castings with open doors and bottom. The wheels were cast with one rubber pad integrally molded in. 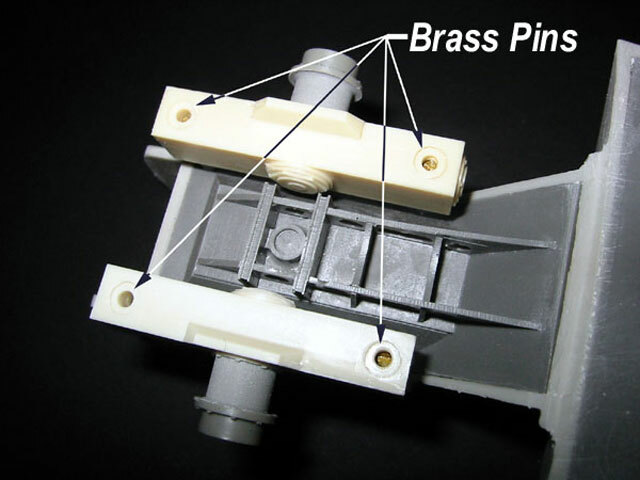 The rest of the rubber pads were contained in specifically designed and molded trays that protected the fragile end connectors from damage. Now that is what I call thoughtful packaging. Enough of this already let's start gluing resin! Assembly started with the engine pods. I cleaned off any flash from all the joins to make sure all the parts fit perfectly. Three of the doors on the cabin modules were glued shut. This is the only area of the kit where I experienced fit troubles. The door openings were a little uneven and the walls were molded thin to appear to scale. This caused me a some grief when I tried to enlarge the opening to match the doors, modelers with ham fists should wield dull blades. I filled the resulting gaps with Zap-A-Gap and sanded them smooth. I was able to assemble the entire vehicle frame within five days. The suspension base had several locating pins broken off in transit. These were superglued and pinned in place with 3/32" brass rod. The axles were also pinned to ensure the glued joins don't snap. Drive shafts from the engine were not included in the kit. There is a mysterious port in the sides of the hull. I didn’t know what these were for until I checked Walter Spielberger’s book, Spezial Panzerfahrzueg. There is a cutaway drawing of this beast and it shows the drive shaft turning a sprocket located inside the wheel that engages a cog along the inner rim of the wheel. Those wacky German Engineers! Anyway back to the drive shafts, these were made from two sizes of plastic tubing. The thinner of the two was inserted into the port in the hull and cut short of the wheel. The outer tube was slide over this shaft and when the wheels were finally glued to the hull, the outer tube was glued against the wheel. Neat and flush without all the test fitting! I am so lazy! 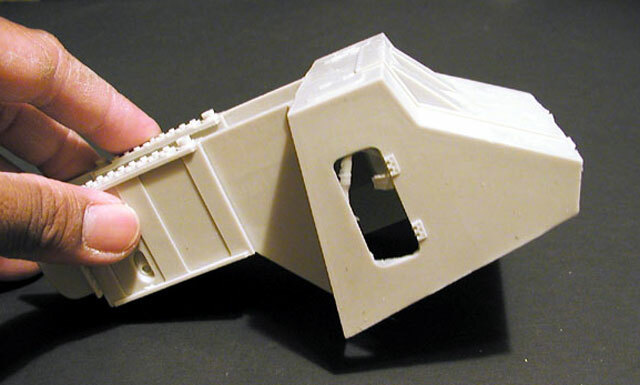 The most difficult part of the assembly was the hinge point. You have to make sure you get all the parts in the right place before glueing anything together. Test fit thrice, glue once. This was one of the few armor models I used an airbrush to paint. I tried hand painting one end, but after an hour and the second coat of paint, laziness gave way to speed. I sprayed the model overall Polly S Dark Panzer Yellow. Then a meandering green camo was sprayed on using Polly S NATO Tricolor Green toned down with Panzer Yellow. I know it ain’t the “right” color, but my Panzer Green had dried up in the bottle. 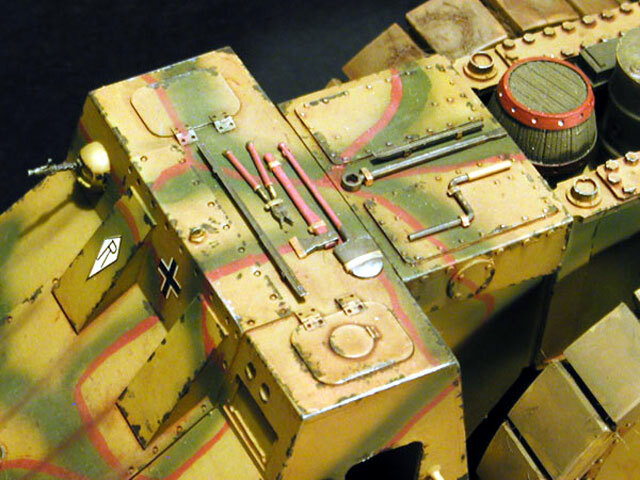 I hand painted some Red Primer as the Panzer Red Brown to add contrast to the sprayed on green. Truthfully, I’m not happy with the way it looks. I may repaint it again in the future. I gave the model a wash of burnt umber oil paint. I put the wash over the entire model, not just in the nooks and crannies. This has the effect of unifying all the colors and making the model look less garish. I mean c’mon, green, red and dark yellow? Christmas colors at the very least and wrong wrong wrong for this season. I just shiver. I mixed a little pastel brown, red brown and black with Tamiya Thinner and added streaks to the paint job and more depth to the shadows where needed. Straight pastels were used on the mufflers to get the brighter orange rust color. Chips in the paint were added using Testors' Metalizer Titanium and a pointed brush. The lower edges of the hull and wheels were lightly sprayed with Polly S Dirt. I mixed Polly S Dirt, Future, Tamiya Flat base and static grass together and applied it to the lower edges of the hull and to the wheels. The markings came from various sources. 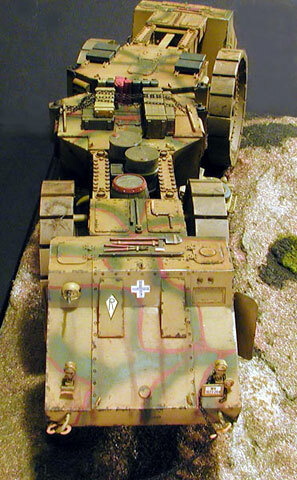 The national markings and vehicle number are from Tamiya's Marder III kit. The diamond R from CMK's VW Bug and the license plate from Tamiya's Kubelwagen kit. All the decals were applied directly to the flat paint and settled in with Solvaset. With a model this big and “flexible” in the middle, I felt the need to put it on a base. This allows me to glue the wheels and hinge permanently giving the model more strength. If I left the hinge workable, there would be too much temptation to “play” with it and breaking it in the future. Makes me wonder when I’ll grow up. I walked over to Daiei Store and found a 16”x 8” picture frame, perfect. I got some Florist Foam and fitted it to the inside of the frame. Basswood walls were created to give me a guide for carving the roadbed as well as making the edges neater. I carved the foam until I got a slightly curving and rising roadbed. I covered this with Plaster carefully forming the road and the drop in the lower left corner. A straight and level road, though easier, is too boring. After drying overnight, I sprayed everything Gloss Black, frame and edging inclusive. Three coats of Gloss Black sealed the plaster for the subsequent colors. The roadbed was then sprayed Polly S Dirt to represent the dirt roadway and the soil areas Polly S Olive Drab. Woodland Scenics static grass and foam grass was added to the roadsides. Despite the size and cost of the kit, there were precious few details to be added. This may be due to the fact that the original never developed past the prototype stage. I couldn’t allow this. I decided to hypothesize what equipment would be needed on the operational vehicle and add it to the model. First on the agenda are some lifting hooks for the various access panels and covers. Considering the size and position of some of these, it’s safe to say these are necessary items. Next I added some handrails. The crew has to get up to those little doors out in the field without the benefit of a ladder somehow. For self-defense, I added leftover Kugelblende from Dragon’s Pz III kits. 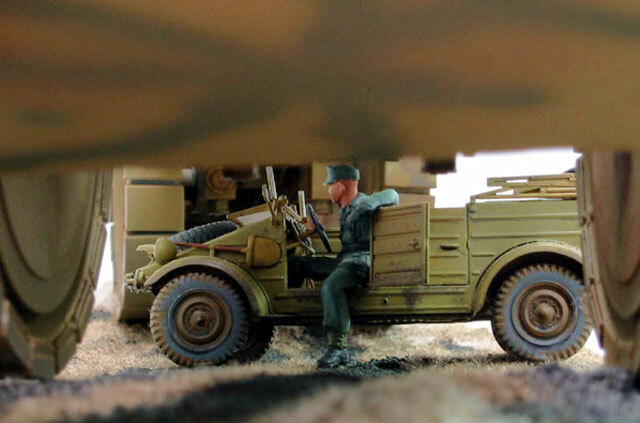 Tools came from several Tamiya Pz IV OVM sets and the wooden boxes from Trakz 1-1/2 ton GMC Cargo set. The barrel and 55-gallon drums are from Verlinden. The leftover rubber pads from the wheels were added to the engine deck on rails made from Evergreen H-stock. I added tow loops from wire solder to the front of both cabs. I figure they have to tow this thing once in awhile, maybe with five FAMO’s? Two S-hooks and some chain were added to the front cabin. I added a Tamiya Kubelwagen under the Räumer to lend a sense of scale. This entire project took me 3 weeks to complete. I rushed to get it ready in time for the IPMS-Hawaii armor night. Anybody got a 1/35 scale VW Bug they need Monster Krupp’ed?